The massive change that is evolving around the concerns of data does not have a distant relationship with humanity as it’s obvious that without the human race, there is most likely a world declined of valuable data storage, communication, processing, and utilization. 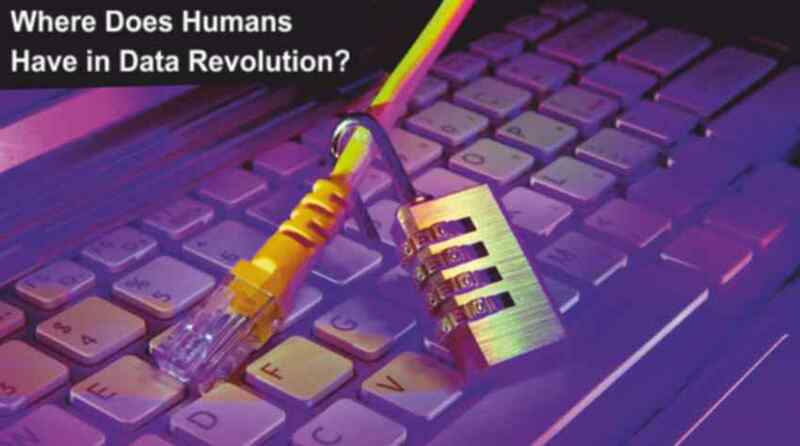 We the humans are the source of most and if not all the massive data accumulation taking place in the world. But the question remains, are we being left out of the equation? For over a decade, the term data have been at the top of the enterprise agenda. Amongst all of the enterprise concerns, there is a robust ecosystem found around all aspects of data (collection, storage, processing, management, exploitation, and disposition). In one of the discussions within Global 2000 executives, the discoveries were that many people are dissatisfied with their investments in the data market, and to attain a good height of clarity in this field, it was noted that the problem was not from technology neither from the technique, but is solely the people. To discuss data and to eliminate the human from the equation is just like talking about water without Hydrogen which can’t be done. The impact of data is being witnessed in literature, Sociology, and anthropology, which are the reason why we cannot discuss the matters related to data and its management and leave human out of it. Data started with a man and surely will end with man. It’s a thing of utmost concern and more of considerable reasoning to find a way to put a man in the field to manage and control how the data in every organization comes in and goes out. The age we are in, according to the scholar’s curls the term “personal data gold rush age”. It is not surprising that the beneficiary of this gold rush is the source of the data gold being the people. Do you know that if you are not paying for the service, then you are the product? Data “accumulation is mostly occurring with minimal consideration of the people who, along with their information is being taken down, who are the individuals at the heart of this process,” according to Haddadi and co-researchers. How is Data Collected and By Who? Marc Andreessen, a venture capitalist, a voice for all things tech, in his consensus realized that it is generally not practical to withdraw completely from all the online activity which we are taking part in, and made it into four simple words: “We are practically choice-less.” Whenever an individual goes online, they generate data, which they do not know how to manage and protect. With this concern and more of a topic in recent days, there will be the emergence of Health and Human Service that will be devoted to protecting citizen data. In their responsibility for data protection, the data of individuals will be made into fragments across several federal agencies. Here the new Citizen Data Protection Agency will take the place of Homeland Security, standing as a collective chain of various parts of the federal bureaucracy. Prior to the days of the data revolution, most of the point and comments from people were very positive, focusing on how possibly, the concept of data would make the world a better place: how self-driving cars would possibly reduce the number of fatal occurrences witnessed daily on the road (17,775 in 2016, according to the records of National Highway Traffic Safety Administration), how investing wisely would increase rates of return and reduce loss, how quality medicine would improve the term of customizing treatment plans, the role of education in personalizing lesson plans for each student, and how the concept of smart shopping would create memorable customer experiences and improve the customer relationship, etc. Currently, in the discussion of data management, we can see that what was meant at the starting point of these ideas are not really being met such as; give me information and I will pay you quality return for it. Today we found out that, some enterprises are taking your information without giving anything in return. Data can be found everywhere, in tablets, smartphones, smart watches, computers, wearable and also in the traffic systems (road traffic management and financial systems). So with this idea, it is advised that we try to manage how the information leaves and comes to us. The concept of human data interaction is important enough and qualified to become a discipline in itself. Proper utilization of Data is needed and none other time than now, to the right person and for the right purpose.